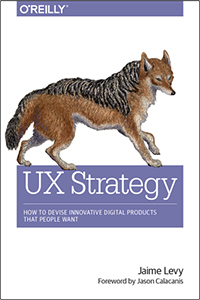 User experience (UX) strategy requires a careful blend of business strategy and UX design, but until now, there hasn’t been an easy-to-apply framework for executing it. This hands-on guide introduces lightweight strategy tools and techniques to help you and your team craft innovative multi-device products that people want to use. 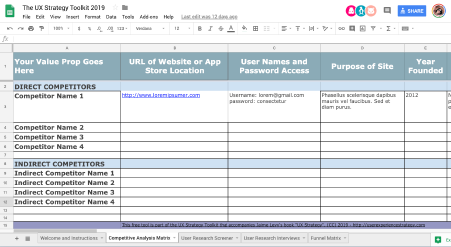 This complimentary toolkit allows for you and your team to collaborate on competitive research/analysis, user research studies, and funnel design strategies. You can make a duplicate of it to your Google drive or download it to work in your favorite spreadsheet program. Enjoy!